..... Click the link for more information. also may cause landslides by shaking unconsolidated or weathered material from slopes. Rockslides triggered by an earthquake in Montana in 1959 caused an entire mountainside to slide into the Madison River gorge, killing 27 people in its path, damming the gorge, and forming a new lake. Humans have triggered a number of tragic landslides that have caused great damage and loss of life. In the Los Angeles area of California, extensive real estate development carried out on hillsides has resulted in widespread mudflows after winter rains have saturated the over-steepened embankments of soil. In some areas, slow-moving earthflows have been initiated by the lubrication of certain types of underlying clays by septic tank effluent. Submarine slides, or a sliding mix of seawater and sediment, are called turbidity currents. Undersea landslides can travel several hundred miles across very gradual slopes, riding on a thin film of water that reduces friction. the sliding movement of rock masses down a slope under the action of the force of gravity. Landslides occur on particular segments of an incline or slope as a result of unbalance of the rocks caused by an increase in the steepness of the slope through erosion by water, weakening of the rock by weathering or supersaturation by precipitation and groundwater, seismic shocks, or construction and economic activity carried out without consideration for the geological conditions of the terrain (breaking up slopes by road excavation, excessive watering of gardens and orchards on slopes, and so on). Landslides most often occur on slopes composed of alternating impervious (clayey) and water-bearing rock (for example, sand and gravel or fissured limestone). 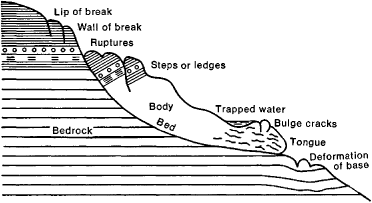 The development of landslides is also promoted by types of bedding in which layers are inclined in the direction of the slope or are crossed by fissures going in the same direction. Landslides assume the form of a flow in strongly moistened clayey rock. A landslide is often semicircular in cross section (see Figure 1), forming a depression in the slope that is called the landslide cirque. Landslides cause great damage to farmland, industrial enterprises, and populated areas. Reinforcement works and drainage structures are constructed to combat landslides, piles are driven to secure the slopes, and vegetation is planted. Knorre, M. E., S. K. Abramov, and I. S. Rogozin. Opolzni i mery bor’by s nimi. Moscow, 1951. The perceptible downward sliding or falling of a relatively dry mass of earth, rock, or combination of the two under the influence of gravity. Also known as landslip.